Spain had relied almost entirely on imports for its automobiles and in the late '40's the government contacted FIAT in Italy with a view to begin some sort of license production. In 1950 the Sociedad EspanolA de Automoviles de Turismo (S.E.A.T.) was formed and chose for its vehicle to build, not the little 500, but a medium sized sedan, - the Type 1400. A desire to broaden the market resulted in the decision, in 1957, to build the enormously popular Fiat 600, already in production in Italy for some two years. This car was one of the world's great success stories - its roominess for its size, good looks, robust construction and reliable four-cylinder engine resulting eventually in the building of 2.7 million examples. The license built S.E.A.T. 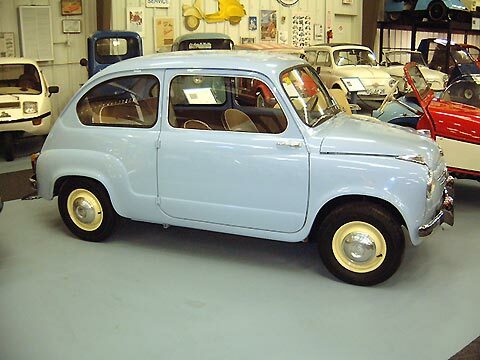 600 was distinguishable from the Fiat 600 only by a different front emblem. Later model changes followed their Italian Counterparts. Eventually, more uniquely Spanish variants would be built. One of these, the Furgoneta Comercial, substituted the rear seat with a storage box with lid. There was still no rear access, so many owners removed the passenger seat. The rear quarter panels were replaced with steel. Another variant was the 800, still with the 767 cc motor, but with a wheelbase stretched by 18cm and four doors hinged at the same B-pillar. A small set of rear quarter windows was added also. Few examples remain of this model which was replaced by the regular Fiat 850. Spanish production continued into the seventies, long after the Fiat 600 had been discontinued. Weight: 580 kg Electrics: 12 v 4 Wheels: 5.20 x 12"